Hump Day Miscellany – Ta Ta! I’m going to Peru in just about 24 hours! Too bad I have 30 hours of preparation to do! Just kidding. I only have to add some clothes to my bag, clean the house, get some sleep and go. In my haste to get ready I forgot to empty the pockets of my jeans before I washed them and I just annihilated an expense check for $78. 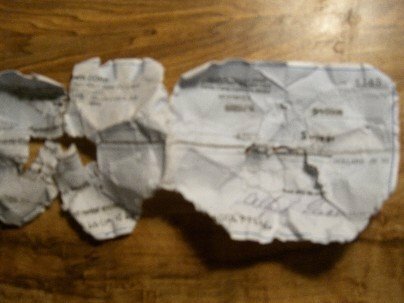 There was enough left to photograph and send to accounting so they can cut me a new one. Oh how I love digital technology! I’m really glad I called Cingular to ask about International rates on my phone because the guy said if I turn my phone on in Peru and someone calls me and leaves voice mail it will cost $3.49/min. That’s right – $3.49/min if you so much as pick up a signal from a tower. If you actually use the phone they continue to bill you at that rate. I’m sure the unwary generate bills that exceed the GNP of Peru every day. I’ll leave it turned off. Happy training and racing to all and of course I will post pictures when I get back. Ta ta, peeps!! 11 Responses to Hump Day Miscellany – Ta Ta! Miss you already! Have a blast!! safe travels. have a great trip!we will miss (per)u!! have fun! you’re already gone, i fear! And yes, i know ALL ABOUT phones overseas. gah. Enjoy your trip. Think positive, at least you don’t get crazy to try to remember where you put the check! Hope you’re enjoying Peru. Post lots of photos – would love to visit someday. have fun on your vacation – peru sounds really fabulous!